Graff in Switzerland - Familienverband Gräff - Graeff, Historie-Gegenwart-Zukunft e. V.
The originally swiss family Graff said that they belong to the german Op den Graeffs. They descendant from Isaac op den Graeff van de Aldekerk (born around 1525), son of Abraham op den Graeff (1485-1561), the alleged son of Wolfgang von Graben (1465.1521), ancrestor of the german Op den Graeff, and brother of Herman op den Graeff van de Aldekerk (born 1520). 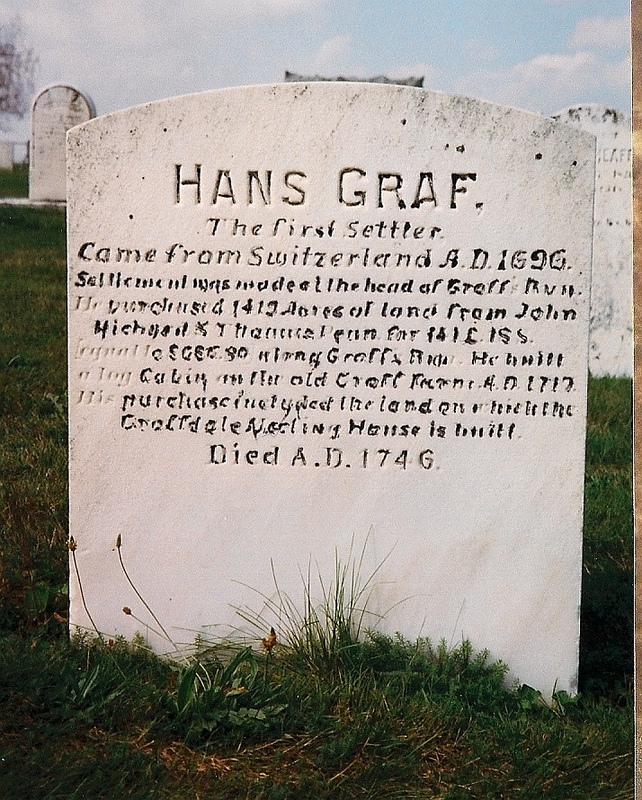 Isaacs (alleged) descendants lived in Switzerland until 1695, when Hans Graf(f) and his brothers from Bäretswil arrives to Pennsylvania, United States. 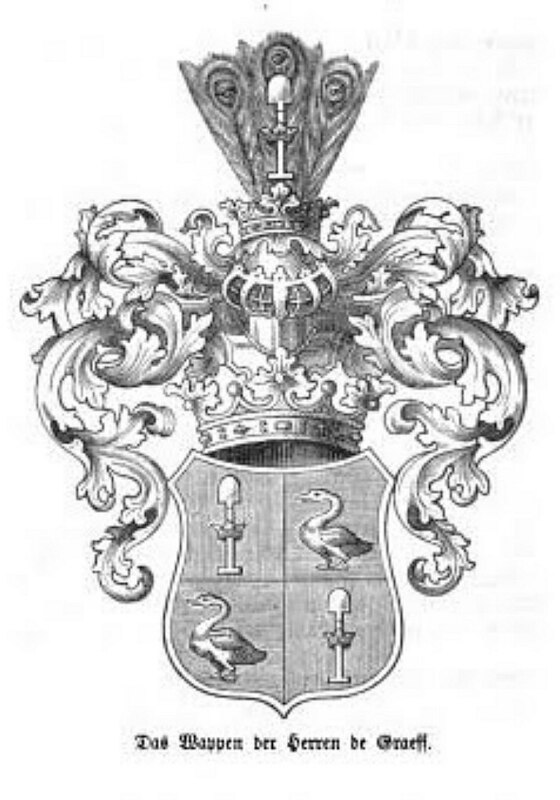 There could be found an old coat of arms of the Groben (misspelling of Graben) familx in Switzerland, as the alleged coat of arms of the Op den Graeff/Graff-ancrestors and of the Graff family itself. Hans Graf(f) (1661-1746) was born in Bäretswil, Switzerland, and during the persecution of the Mennonites in his native country, he with others fled to Alsace. Later he came to America and became in the new world a man of wealth and prominence. 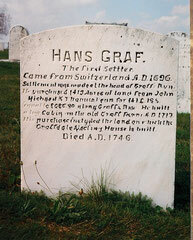 Hans Graf arrived in Pennsylvania about 1695 and emigrated to Germantown where he remained several years. Hans with other Mennonite families moved west and took up their abode on the northern side of Pequea Creek. It was not until 1717 however that pioneers found their way in to Earl Township, Lancaster County. 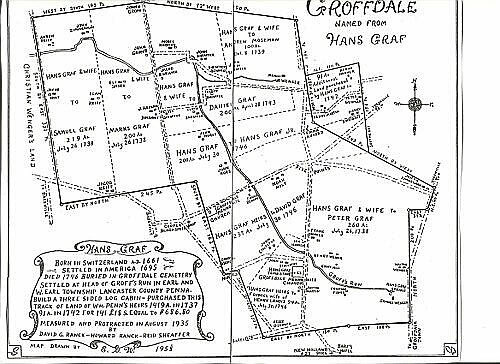 This honor belongs to Hans Graf, for while in pursuit of his strayed horses, he found his way into what is familiarly known as Groff's Thal, within the limits of west Earl Township. Pleased with the country, he had his wife, children and chattels conveyed thither and located on the stream now called Graf's Run, where he soon took up land. He was the earliest settler in these townships, so also was he the wealthiest citizen at the time of his death in 1746. This Hans Graf was a man of more than ordinary force of character; he was the principal person in the new settlement that sprung up around him, even to the time of his death his name frequently occurs in the Colonial Records; he was one of the persons named to lay out the King's High Road from Lancaster to Philadelphia in 1733. Along with many others he was naturalized on Oct. 14, 1720, in the third year of the reign of George the second. He had already built a mill prior to 1729 and when in that year the township was organized the citizens honored both themselves and him in giving his name 'Graf', in its English equivalent, Earl, to the new district. The foundation stones of the cabin he built in 1718 are yet to be seen in the barn yard of his lineal descendant, Levi W. Groff, who owns the residence on the old homestead. The survey of his land was made on October 4, 1718 and calls for 1150 acres; on the 28th of February 1724, he bought 250 acres from Martin Kendrick and Hans Herr, who had purchased 5,000 acres from Penn on 22nd of November, 1717. Under these two warrants there were surveyed to him, in a single tract on a branch of the Conestoga, 1419 acres on October 10, 1727, for which a deed was made to him by Thomas Penn on Nov. 18,1737. This deed after citing the circumstances of the survey, goes on and makes transfer "of all mines, minerals, quarries, meadows, marshes, etc. The price paid for this goodly tract of land was L 141, 180 and One English shilling quit rent for every one hundred acres, to be paid annually on every first of March in the city of Lancaster, Penn. Ascertaining in some way that his tract did not contain the full number of acres called for by his deed he asked for a re-survey, which was granted October 16, 1742, when 91 additional acres were given him as shortage. West Earl also boasts of having had within her bounds one of the first, perhaps the first Mill in Lancaster County, Penn. This stood on the south side of the Conestoga, right at the point where the Concalico unites with the stream. It was made a corner of Warwick Township when that district was organized in 1729, and only through that fact has its existence been preserved from utter oblivion. How long it was there prior to that date is unknown. An ancient deed covering this spot was also found and mentions it as a mill site and speaks of the mill race, but the mill had even then disappeared. Hans Graf the first settler in these townships was the builder and owner of this early mill. Other evidence of Hans Graf: Rupp's Collection of Thirty Thousand Immigrants to Pennsylvania page 433 - "Hans Graf came to Germantown in 1696. Also Hans Graf was Naturalized October 14, 1729. His brother Martin Graf, was first constable.